We used beef for this recipe but the marinade is great for chicken and shrimp as well. You can prepare and marinate ahead of time or give your favorite protein 10 minutes to absorb the flavors. The marinade is tasty so no need to add more but you can choose to finish off your fajitas with greek yogurt and/or cheese. For those watching their carbs, choose lettuce to wrap your fajitas or simply add to your favorite greens. Whisk together first 6 ingredients for marinade. Add beef and let marinate for 10 minutes and up to 24 hours. Prepare vegetables as directed and set aside. In a large skillet or wok, cook beef with marinade in 1 tbsp of grapeseed oil at medium-high heat until no longer pink. Remove from skillet and keep warm. Add vegetables to skillet (add another tablespoon of oil if needed) and cook until tender soft. 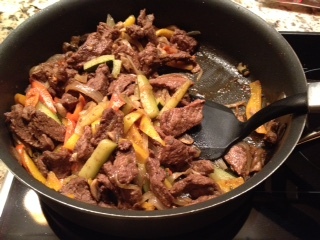 Add beef back into skillet with vegetables, and cook until all liquid is evaporated and mixture begins to char. Remove from heat. 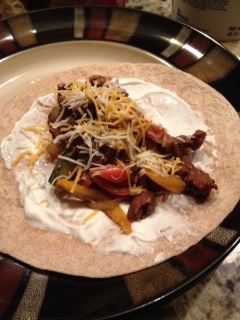 To prepare fajitas, take one tortilla and spread 1 tsp of greek yogurt and/or salsa on it (if using). Add 1/2 cup beef and vegetable mixture to tortilla. Sprinkle with cheese (if using). Roll and enjoy!